Bioroids and Bombots: Vehicles: Badger Armoured Car. 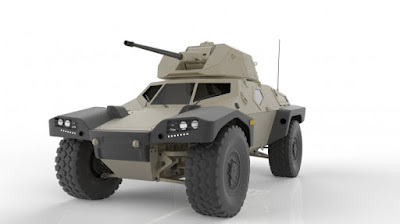 The Panyuan Badger is marketed as a full spectrum military vehicle, suited for all operations from peacekeeping and internal security to major theatre war. Many military regiments and installations include a few Badgers which are used for liaison, scouting and light patrol work. They are also popular with private security firms. Many police and sheriff departments hold a few Badgers for special situations. A variant modified for operations on Mars has attracted several buyers. The Badger is a compact four-wheeled armoured vehicle. Non-pneumatic tires are usually fitted and the vehicle has all-wheel steering and adjustable ground clearance. A hybrid-electric power system allows it to move very quietly with reduced thermal signature. The Badger has janus steering and gearing so can be driven with equal faculty in either direction. Because of this feature crews do not refer to the vehicle having a front and rear end but as having a “sloped” and “stepped” end. The sloped end features steeply angled armour that offers increased protection from fire, while the stepped end offers better visibility. The sloped end is driven by video pickups, with periscope backups. The well armoured sloped end has a single crew position. The stepped end has an armoured windscreen and two crew positions. Two armoured visors can be lowered over the windscreen. When open these visors shade the windscreen and keep snow and rain off. With the visors lowered the vehicle can be driven by video pickups and periscopes. Driving at speed is usually performed stepped end forward while approaching potential threats is made sloped end forward. The Badger has three crew positions, each having a mine-resistant chair that can be swivelled to face inward or outward for driving. Each crewman has controls that allow him to operate the weapons systems or drive the vehicle by video display. Headsets provide the crewmen with an augmented reality that creates the illusion that the hull of the vehicle is transparent. 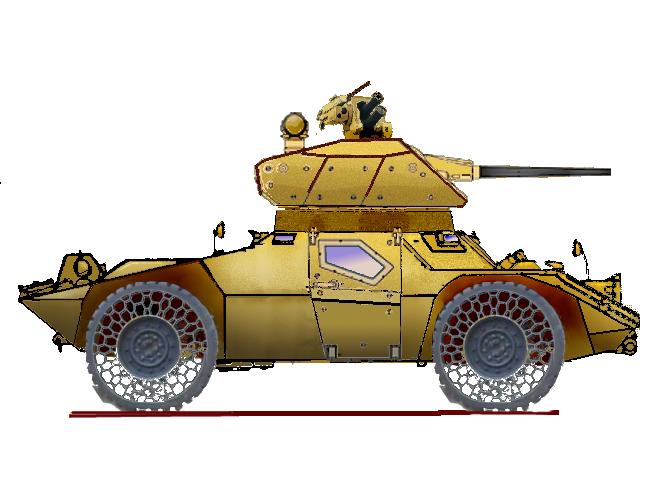 The Badger is provided with an AI so can drive itself or be operated remotely. Effectively the Badger can be thought of as a wheeled cybershell that can carry three to five people. In some poorly trained armies the AI does the shooting and driving while the crew act as observers and directors. There is an armoured door on each side of the vehicle. Each door has an armoured window further protected by a louvre-like grill. Each door is provided with a firing port. Two fold-down “jump seats” are provided for extra passengers, although the interior is cramped with five baseline humans present. Various turrets are available. A popular pattern has a mounting for two .50 calibre machine guns or weapons of similar size. A typical armament might be a 30mm ASP cannon and a 10mm Emag. Automatic grenade launchers, lasers, electrolasers and water cannon are other options. Pylons on each side of the turret can mount launch tubes for missile systems such as the ILCAS-90 and ILCAS-170 which can be operated from within the vehicle. A co-axial firing port for ILCAS-40 munitions is also provided on the most recent models of Badger. 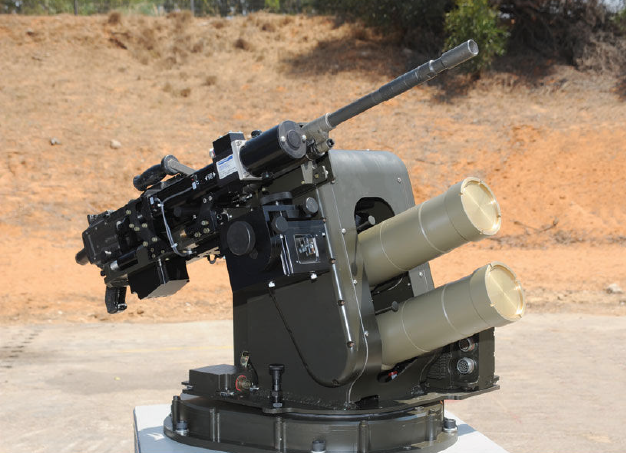 This can be used to launch LLW projectiles or 15mm, 20mm or 30mm mini-missiles. Although the turret is unmanned an observation hatch is provided on the starboard side of the turret roof. This allows one of the crewmen to observe the surroundings “heads-up” from a high vantage point. The hatch can also be used for such tasks the firing of flares, throwing hand grenades or the launch and retrieval of flying minibots and millibots. Behind the observation hatch is a sensor mast mounting electro-optical and millimetric systems. The Badger can locate and designate targets for other weapons systems. The port side of the turret roof mounts a remote controlled weapon station equipped with several countermeasures launch tubes. The latter are fired automatically against incoming missiles. A threat detector is mounted each end of the hull at opposite corners. 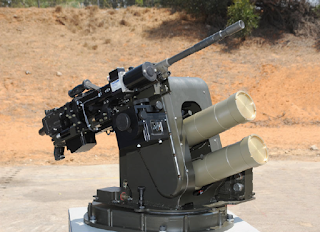 Some models also mount a 7.5mm machine gun on this station too, in a system similar to the Israeli “Bright Arrow”.